When You Purchase Any 2 skinSense Products! Whether you're targeting fine lines or dehydration, the highly concentrated skin treatments will rejuvenate your skin for a plump, healthy complexion. Developed with skinSense's ground-breaking lamellar technology, these targeted treatments and serums drip-feed the active ingredients deep into the skin layers for long-lasting protection and hydration. 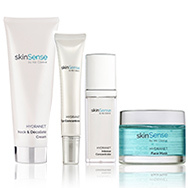 skinSense means just that: skincare that makes sense to your skins needs. 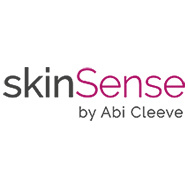 Created by Abi Cleeve, best known for bringing Swiss suncare brand Ultrasun to the UK, skinSense combines innovative lamellar technology with highly concentrated active ingredients to address the signs of ageing to leave skin hydrated and healthy. With 20 years of industry expertise behind her, Abi was keen to use her knowledge of sunscreen formulas and translate them into skincare solutions – If UVA and UVB protection could provide long-lasting protection to our skin throughout the day, then why can’t our skincare do the same? skinSense was born; A longwear skincare that locks in the active ingredients to deliver all-day long-lasting benefits and give skin back its youthful bounce. Discover how lamellar technology works to make skinSense skincare more effective. See how the technology in the skinSense range is so unique. Read all about how #TeamGorgeous loved trialling skinSense products. How does Lamellar Technology work? Lamellar structures are made up of fine, alternating layers that form an even bond with the skin. This bond acts like a suit of armour over the skin, drip-feeding the active ingredients through the skin layers over 8 hours. The lamellar gel structures form an invisible film around the ingredients to help penetrate them deeper into the skin. In short, lamellar technology helps the ingredients work better and for longer. The lightweight textures means they are quickly absorbed into the skin to start delivering the protecting and hydrating benefits deep into the skin layers. The gel formulas also mean they are suited to all skin types and are a great base for makeup. 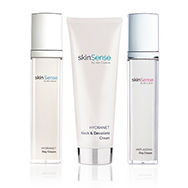 skinSense is divided into two ranges - Anti-Ageing and Hydranet. 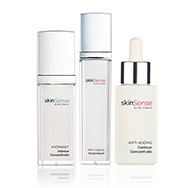 The anti-ageing range is skinSense’s signature collection that helps tackle 3 key skin concerns: fine lines, pigmentation and loss of firmness. Developed with Linefill, a derivative from cold-pressed Sesame Seed, this anti-wrinkle wonder complex works to mimic the fatty cells in the skin that help our skin look plump and youthful. We LOVE the Overnight Leave on Mask to transform tired, dull-looking skin restoring bounce and radiance! Created with Hydra-Protect Complex, the Hydranet range helps to optimise the skin’s moisture levels and reinforce its natural ability to protect from environmental aggressors. Combining 4 key ingredients, the hydrating range delivers instant and long-term moisturisation by regenerating the skin’s lipid barriers and protecting it against external aggressors, such as UVA, pollution, diet and infrared A. Both ranges are perfect to mix and match for address individual skincare concerns and each product can easily fit into your existing routine to create a truly bespoke approach to your skincare.